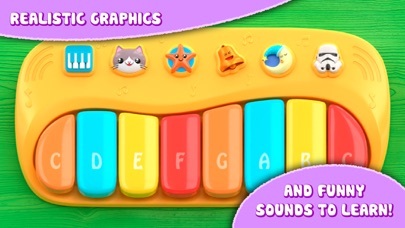 Fun musical piano game for babies and kids, with realistic visual effects and full color for an early stimulation of your baby's development. 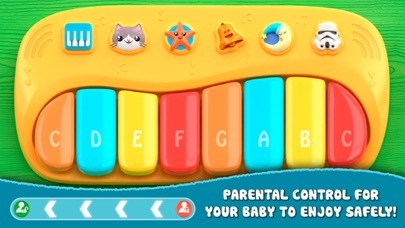 Contains 6 fun features for your baby: - Piano with 8 notes. - Kitty sound mode. - Drops sound mode. - Ringing bells sound mode. And two song modes: - Lullaby. - "In a Galaxy far, far away". ****** Parental Notice ****** ## Game tested by the developers' kids. ## Your baby won't see ads or be able to click on them, as these ads are optional and can only be viewed in parental mode, and won't be able to make purchases in the app accidentally. The parental mode can be accessed by dragging the parental icon to the left, and inside its menu you will find: -Back to the piano. -View an ad and unlock all features for a limited time. -Buy all the functions of the game forever. -Quit the game. Let your baby enjoy without interruptions!